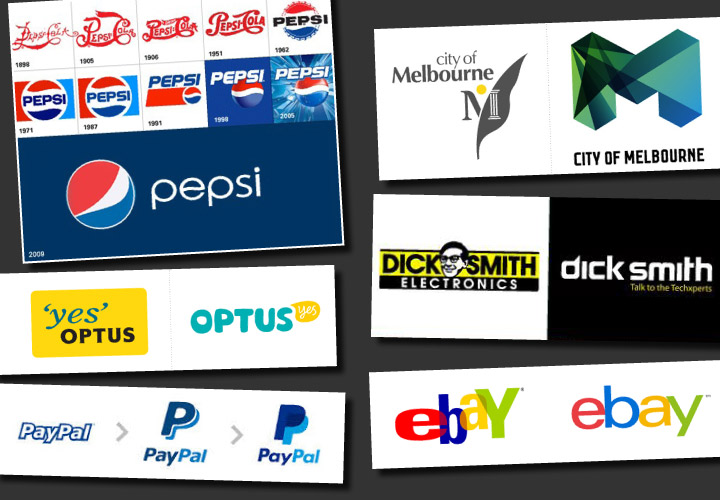 Is your logo design out of date? Tired? Is your current website design from the dark ages? A brand refresh is a makeover for your company... a better haircut, up-to-date outfit, and new shoes that transform how a person is perceived. It's the same with your brand. There may be specific elements to keep, update or add to. Or a new look, tone and presentation of the overall program is needed. Rebranding will maintain a visual connection to how the brand was seen before. But the "new suit" makeover is up-to-date, vibrant and captivating. There have been some interesting recent well known examples of how a little tweak to the font and supporting graphic of a logo design can give your brand the visual makeover it needed, whilst loosing none of the recognition it had built over decades previously. It took Pepsi five months to revamp its famous logo, the new logo is a white band in the middle of Pepsi's circle that loosely forms a series of smiles: A smile will characterize brand Pepsi, while a grin is used for Diet Pepsi and a laugh is used for Pepsi Max. The new logo is Pepsi's 11th in its 110-year history. Seventeen years ago, eBay created a new way for people to buy and sell. They have also recently introduced a refreshed logo design. They believe the new logo is a cleaner, more contemporary and consistent experience for users. Refreshing your brand is something that every business needs from time to time, the logo is often the first place to start, and then there is the process of updating everywhere the logo appears, business stationery, company brochures, sales catalogues, website design, social media profiles and so on.. Treat your brand with respect and dignity and give it the makeover that keeps your business current, fresh, modern, and contemporary.